Manchester - Sergio Aguero's possible return to fitness could give Manchester City a significant lift as they seek to stay on top of the Premier League with victory against Stoke City on Saturday. The striker, who is one goal short of equalling the club's all-time scoring record, broke a rib when a taxi in which he was travelling crashed into a lamp post in Amsterdam on September 28. Argentina's national team doctor Donato Villani suggested during the recent international break that Aguero would be out of action for six weeks following the crash, yet the forward resumed light training on Tuesday. City are wary of rushing back the 29-year-old too quickly, as they are conscious that a further blow to the ribs could cause more damage if the injury has not healed properly, and will leave a decision on his availability as late as possible. 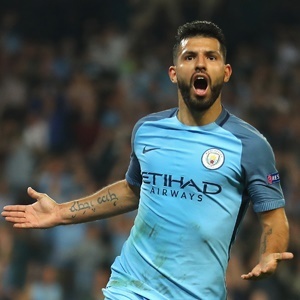 A total of six goals in five games during September took Aguero to a total of 176 for the club, and one more will equal the City record, set by Eric Brook between 1928 and 1939. If Aguero does not make it, City will hope that Gabriel Jesus can rediscover his club form after three games without scoring, his longest goalless run since arriving at City from Palmeiras in January. Jesus used the international break to show that he still has no problems scoring for his country, with two goals as Brazil completed their successful World Cup qualifying campaign with a 3-0 victory over Chile. But whoever plays in attack, City will face a tough game, according to midfielder Ilkay Gundogan. "I know Stoke are uncomfortable to play against," Gundogan said. "We have to be on our game from the word go and be at our best because we want to keep our good form going as long as possible." Without Aguero for their most recent league game, free-scoring City still won 1-0 at Chelsea to remain ahead of Manchester United on goal difference. Kevin de Bruyne, who scored the winner at Stamford Bridge, returned from international duty with Belgium unscathed, despite featuring in a World Cup qualifier in Bosnia last weekend on what he called "the worst pitch I have played on since I was seven years old". France defender Benjamin Mendy, who will miss the rest of the season with cruciate knee ligament damage, is City's only long-term injury absentee, although captain Vincent Kompany remains a doubt with a calf problem. Stoke will look to follow up their 2-1 home victory against Southampton before the international break, but manager Mark Hughes must do so without central defenders Ryan Shawcross and Bruno Martins Indi. Captain Shawcross is refusing to set a target date for his comeback from a back problem while Dutchman Martins Indi is still nursing a groin injury. January signing Saido Berahino is now without a goal in 18 matches for Stoke and 32 appearances overall, following his missed penalty against the Saints. "We've told him that if he starts getting down on himself and losing confidence it will just compound it, so he's got to keep going," said assistant manager Mark Bowen. "We see his qualities every day in training, and I've said to him that one of these days he just needs the old man upstairs to smile on him and then he will be up and running. "He's bubbly in training and we encourage him to be that way. He hasn't scored for a while, but if he beats himself up that's only going to compound the issue."